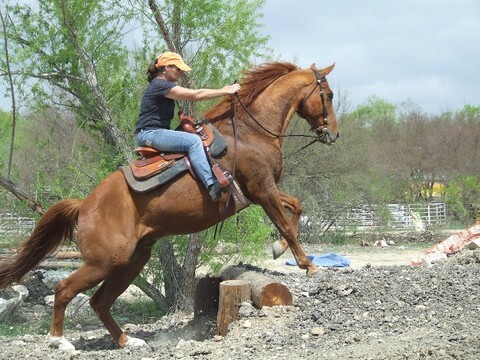 Owner of Brave Horse Center, Anne Van Dyke, playing with Rumor on the Brave Horse obstacles. Directions: Click on the address above to see this location on Google Maps. Brave Horse is located between IH35 and IH10/US90 in San Antonio. From IH 10/US 90 turn north on North WW White Road, turn left on Dividend Dr, come to a dead end / stop sign and turn right on Creekview Dr. and then take an immediate left (the road splits) continuing on Creekview Dr. The Brave Horse Center is easy to spot and will be on the left side of the road. From IH 35 turn south on AT&T Center Parkway, turn left/east on Gembler Rd., turn left on Creekview Drive, pass Dividend Dr. on your right and take an immediate left (the road splits) continue on Creekview Dr. The Brave Horse Center is easy to spot and will be on the left side of the road. Hours: by appointment, call ahead. Overnight Camping is allowed and overnight pens can be provided, please call Anne to make arrangements ahead of time. Dogs, must be kept on leases at all times. Facilities: There is a portable/chemical toilet and running water on the obstacle section of the ranch. There is a round pen, a larger rectangular pen, and picnic tables located under shade trees. Plenty of obstacles are present that can also be used as mounting blocks. The parking area can accommodate approximately 15-20 trailers. There are plans to install electrical/water hook ups but this is not complete currently. Mileage: None at this time but plans are underway to clear out some trails. 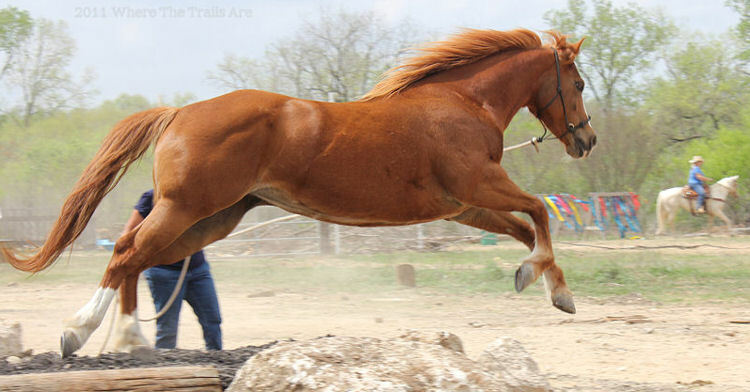 Brave Horse Center is also a part of the Salado Creek Ranch which currently has a few miles of trails, however, special permission must be obtained to use these trails. You might be asking, where are the trails? Brave Horse Center does not have much to offer at this time in way of trails. However, this center has a plethora of obstacles to prepare any horse for the challenge and surprises the trail can throw at them. So if you are ready to hit the trenches (literally there are at least three trenches at this equestrian playground) of obstacle challenges, then Brave Horse is the place to go. Anne Van Dyke has taken on the saying “if you build it they will come” and come they did. 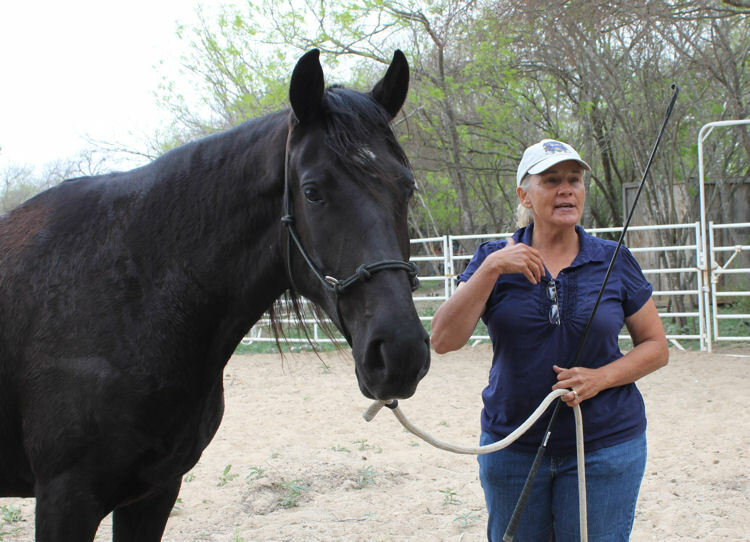 The Brave Horse Center’s first Clinic was full with 20 participants. Anne is continuing to cultivate this obstacle challenge course with great enthusiasm and it is a work in progress. She was observably excited about being able to share such a resource and her knowledge with other equestrians. After attending at least one clinic, individuals can schedule times/sessions to bring their horse(s) to the obstacle course at Brave Horse outside of organized clinics and events. For safety reasons, the center requires you to bring a friend (at least two people – not necessarily two horses) since there may not always be a staff member on hand. The first clinic at Brave Horse, lead by Anne Van Dyke, was held on March 20th, 2011. The Clinic was $50.00, from 9am -4pm (but participants were invited to stay longer if they wanted), and provided a $5.00 lunch. In the morning Anne talked about empowering your horse through desensitization and gave a short demonstration in the round pen with a participant’s horse. For the rest of the morning participants worked in hand on desensitizing their horses to plastic bags and other objects, and also worked their horses through obstacles in hand. After lunch everyone had the opportunity to watch Anne work her horse, Rumor, in hand through the obstacles. 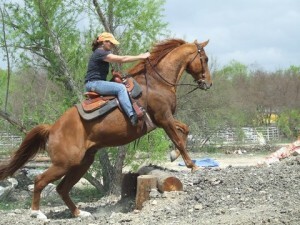 It was a joy to watch Rumor’s athleticism and excitement as Anne skillfully put him through his paces. 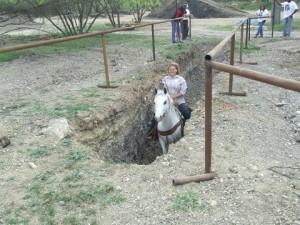 The last section of the clinic consisted of participants saddling up and riding through the obstacles of their choice. The Clinic was laid back, loosely structured, and provided a great deal of flexibility regarding each participant and their horse’s skill level and area of interest. Participants could choose what they wanted to work on and seek out guidance when and if needed. Sue and Noah, who have actively participated in helping with the creation of Brave Horse, were also on hand along with Anne to provide direction and assistance. Photo provided by Richard Van Dyke. The obstacle course itself is somewhat overwhelming when trying to decide where to start. 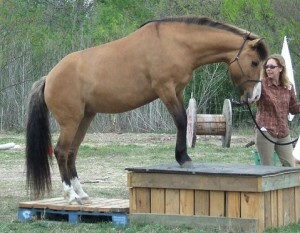 Knowing yourself and your horse is a great plus when determining where to begin. The Brave Horse motto is “A brave horse is a safer horse.” Building confidence is what Brave Horse Center is about, so start on an obstacle you know your horse can be successful on and slowly increase the challenge. Some obstacles are quite advanced and would not be a good starting place if you and/or your horse are new to these challenges. Starting at a difficulty level beyond you or your horse’s skills could result in loss of confidence and trust and even result in a wreck. Working in hand initially before saddling up is a great strategy which the clinic demonstrated. Being able to accomplish your goals from the ground first and then in the saddle is a superb philosophy. 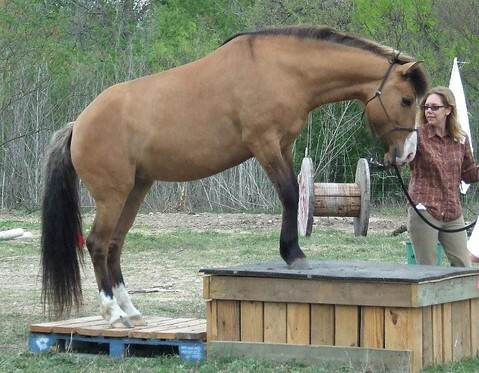 There are many basic obstacles to start with, to begin with you can just pass by the obstacles to get a feel for what your horse thinks of them and then start with something like crossing over logs or poles laying flat on the ground. The center has a circle with several poles spaced widely apart laying flat on the ground and a section of poles spaced well apart all in a row. Once your horse in confident in crossing over poles laying flat on the ground then consider the next step, poles stair stepping up onto inclines and then going back down. There are several stair-stepping obstacles which increase in size, height, and depth. Photo by Richard Van Dyke. Remember, you are the best judge of you and your horse’s safety, just because it is there does not mean you have to do it. There were a few obstacles I felt my horse was not ready for so I did not push it. There is also no need to complete all the obstacles in one day, just pick a few to work on, take it slow or at a pace you and your horse are comfortable with, thus giving your horse (and yourself) confidence! 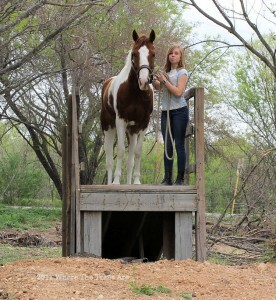 My horse and I spent some quality time at the teeter-totter bridge. 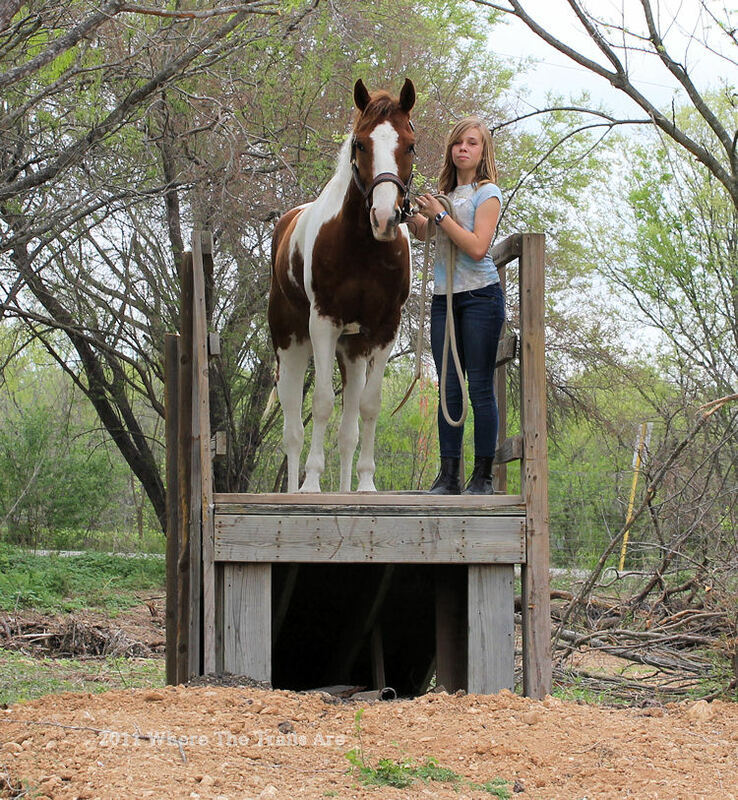 Once we got the bridge down in hand then we mastered it in the saddle. I was so proud of her and learned a great deal about how best to work with Angel and build her confidence on this course. This challenge course is full of flags, tunnels, cowboy curtains, logs, stair steps, ditches, trenches, bridges, and I’m sure there were a few things that I missed. Anne continues to improve and add to the course and she says water obstacles are coming! I call the Brave Horse Center an equestrian playground. My American Indian Horse / Spanish Mustang and I had a blast and learned more about each other. Anne and her husband, Richard Van Dyke, are the owners of Brave Horse, Yellow Rose Carriage, HRH Carriage, and Salado Creek Ranch. Anne is one of the original founders of Yellow Rose Carriage Co. and she has successfully competed in Combined Driving Events.